Technology sometimes makes everyday tasks more and more complicated, resolving one issue leads to another and whilst carrying out the simple task of manoeuvring a vehicle, information overload can lead toan unsafe operation, on the other hand relying too much on passive technologies can lead to driver complacency. Vehicle Collision Avoidance Systems or VCAS is an active technology that goes someway to resolving these issues, whether that be near side object detection for commercial vehicle and cyclist interaction, reversing sensors for heavy mobile plant or direction sensors for detecting when forward vision is limited. ...SAFETY can help save lives and help prevent damage to vehicles. The system is designed to detect the closest object (whether stationary or moving, human or inanimate) in the area of coverage and informs the vehicle operator of its presence. ...COST EFFECTIVE With reversing accidents becoming more common and repair costs ever increasing, VCAS is a cost effective object detection device. VCAS IUS (Industrial Ultrasonics) provides the assurance of safety when a vehicles operation commences, the system cannot be turned off or ignored by operators unfamiliar with its features. Utilising industrialised ultrasonic technology, VCAS produces visual and audible and warnings if objects are detected within pre-configured primary sensing zones. Patented pulsed timed domain radar detects 100% of moving and static hazards up to a range of 10 metres, making it extremely cost eff ective when weighed up against the expense incurred by collision damage and accident injuries. 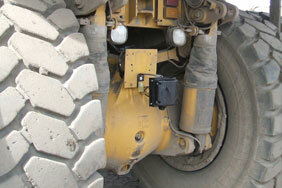 Radar sensor units are cable connected to an in-cab display which informs the driver of approaching hazards through audible tones and a series of LED's. It can be seamlessly integrated with existing reverse alarms so that the alarm is sounded only once a hazard or person has been detected. This reduces the potential for complacency on behalf of the operator as well as unnecessary noise pollution. SiteScan™ is a package of devices that will change the way companies manage their work force. 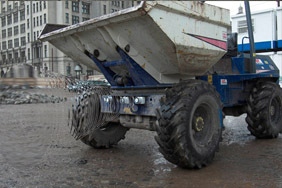 The simplest form is an in cab device and personal tag, every member of staff will be given a personal tag, when site visitors and contractors arrive they will also be given a tag which can form part of the signing in procedure, then when site personnel or light commercial vehicles are within the safe working zone of heavy earthmoving equipment the operator is warned.